It is well-known that riding-posture riding mode is applied to all of self-balancing electric unicycle, which makes riders fatigued after long-time riding. However, Fosjoas has broken the tradition and adds brand-new sitting-posture riding mode to K3. Then, K3 offers people a stable and comfortable riding. Foldable pedals are also user-friendly and they aim at saving space. 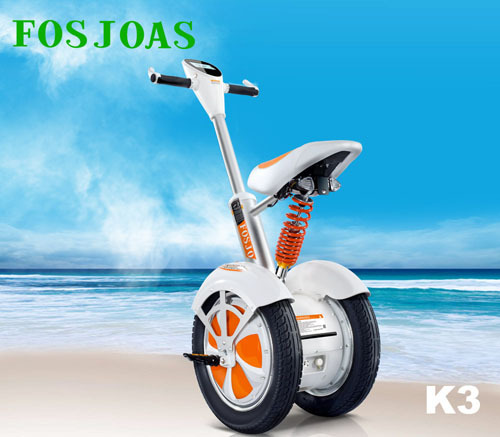 Meanwhile, Fosjoas U3 SUV electric scooter is equipped with foldable aluminum alloy control shaft that is harder, lighter, more durable and stylish. Then, U3 can be put in the trunk easily. Anti-collision bar on the back of handle is also worth to mention. It is helpful to abate impact and abrasion so as to better protect the scooter body. High-definition LED displayer is another humanized design. 4-inch screen is able to clearly show some real-time data, including riding speed, outdoor temperature, remaining electricity quantity and total mileage. Custom-made APP for self-balancing scooters is one of the most significant technological breakthroughs. Although such an APP is only applied to Fosjoas K3, it will be used in other types in the near future. The APP can be downloaded from the official website and installed in the phone. For one thing, all data about K3 will be displayed on the APP and one can read them from the phone. For another thing, one can control K3 by APP directly, such as GPS, speed limit, locking and unlocking the scooter, turning on the lights or connecting Bluetooth and so on. Fosjoas R&D team is always diligent and tries its best to explore more user-friendly elements. Many more perfect top electric unicycle will be provided to consumers. Previous：What If Electricity of Fosjoas Electric Unicycle is Replaced by Solar Energy? Next：What Makes Fosjoas Intelligent Self-Balancing Electric Scooters Enjoy Large Consumer Base?